You know how sometimes you sit down with a sleeve of Girl Scout Thin Mints with the intent of only having a few (and who knows why your brought the whole sleeve with you, but you did) and then a few hours later you seem to wake from a mint-cookie induced reverie to discover you’ve eaten the whole sleeve? That’s kind of what it’s like reading Alison McGhee’s All Rivers Flow to the Sea. Except, when your wake from this reverie to realize you’re halfway through the book there’s no guilt or stomachache, which makes it way better than the cookies. 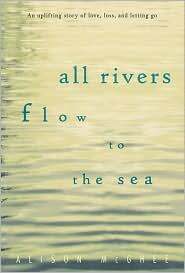 I’ve wanted to read All Rivers Flow to the Sea since Alison mentioned in the 6 questions we always ask that she had a crush on Tom Miller, a character from this book. I’m kind of sad I waited so long. This is a beautiful book about seventeen-year-old Rose Latham struggling with the fallout from a car accident that has left her older sister Ivy not alive and not quite dead yet. The book opens with Rose’s first day of school after the accident. She feels as though she has been plucked out of time and dropped back months from the moment she last remembers. Back at school she has to deal with the hallway whispers about her sister the vegetable and the stares from the boys she uses to cope with her pain. Matters aren’t helped by the fact that Rose’s mom can’t seem to sit still, keeping busy by making potholders and a thousand paper cranes. Plus, she hasn’t seen Ivy since she was moved to a convalescence home two months ago and yet is unwilling to let Ivy die. Rose, of course, visits her sister everyday thanks to William T., a kindly neighbor who drives Rose to Utica after school. Rose walks around in a grieving funk until childhood friend, Tom Miller, points out that maybe she’s not dealing so well with what happened. The novel follows Rose as she slowly comes to terms with her broken family and losing her sister. The prose here is beautiful. The kind of beautiful that made me want to write down every other sentence. I didn’t, because that would have required putting the book down which was not something I was willing to do. This is a short novel that I gobbled up in two sittings. This is the kind of book with filled with the kind of symbolism and metaphors that give English teachers wet dreams, and yet they never seem overwrought or annoying. And then there’s William T. I loved the hell out of him. While all of McGhee’s characters are finely drawn, there was just something about William T. that captured my heart. Though he’s no relation to the girls, merely a neighbor who lives up the hill, he takes care of them when their mother falls into a depression after their father leaves. He takes care of Rose as Ivy lays in the hospital stuck between life and death. He’s the one constant in Rose’s life when everyone else has disappeared — her father lost to New Orleans and never heard from a nearly a decade before the accident, her mother who William T. characterizes as “not quite right,” and poor, poor Ivy. Even though it deals with weighty subject matter, All Rivers Flow to the Sea never comes off as melodramatic or self-pitying. Instead it’s just an honest story of one girl struggling with life. I will warn you that oftentimes you will find yourself blinking back tears, especially at the ending. Endings are tough and oftentimes I think they’re unsatisfying or feel off. But this one is perfect. McGhee got it just right.